If we have a completely closed system of the type you describe – a pocket universe with nothing in it except this grapefruit and this egg – and stick the grapefruit and the egg in it so that they are stationary with respect to one another (as we saw a couple of weeks ago, “stationary” is a rather relative term), then this is what will happen. 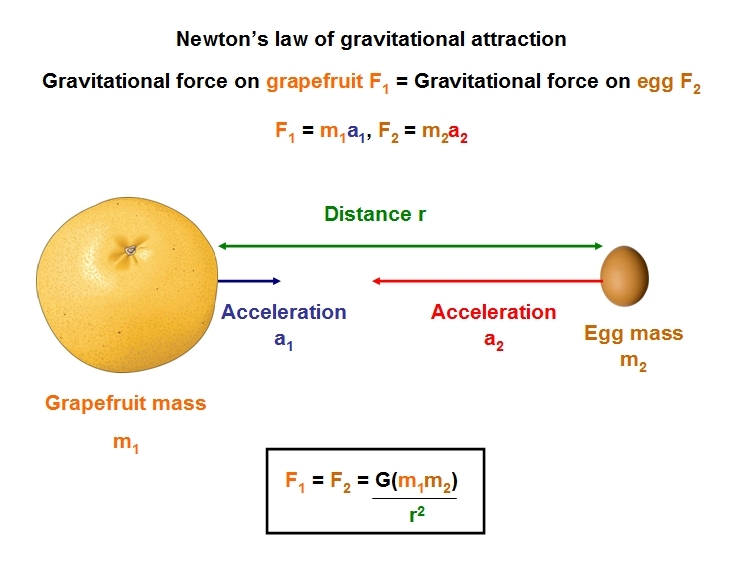 The grapefruit and the egg will exert a gravitational force on each other and begin accelerating towards one another, with the acceleration of each being inversely proportional to its mass (i.e. the heavier grapefruit will accelerate more slowly). 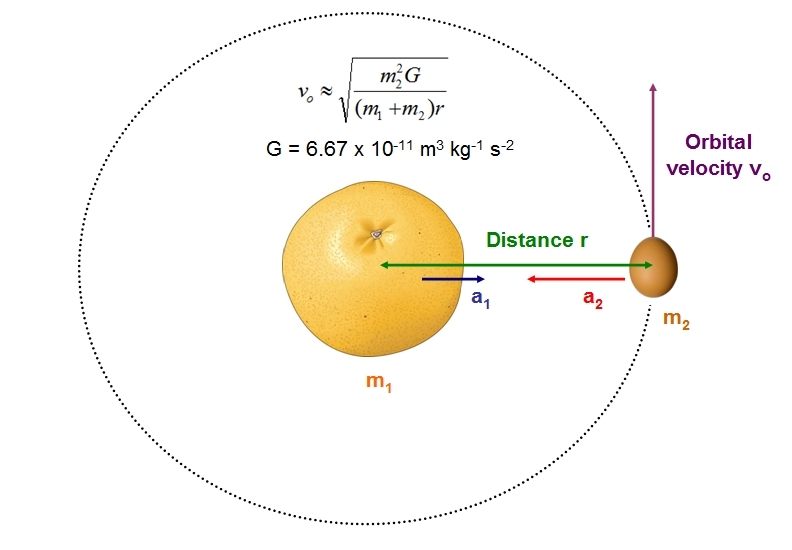 As they close the distance separating them r gets smaller and a1 and a2 get larger; in other words the rate of acceleration on the grapefruit and the egg increases as they get closer to one another. And eventually the egg will smash into the grapefruit, creating some sort of delicious grapefruit cake. 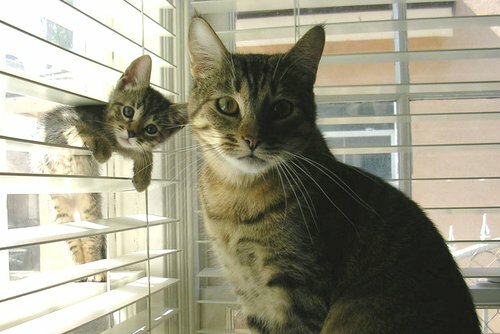 This is what eventually happens to all two-body pairs in isolated systems of the kind you describe. If it’s an orbit you’re wanting, you need to give the egg some sort of lateral velocity relative to the grapefruit when you’re setting up your little pocket universe. Stuff in orbit is still falling towards the thing it’s orbiting around, it just also happens to be moving sideways at a fast enough speed that the surface of the Earth (or whatever) curves away from it at the same rate as it falls towards the Earth. In other words, orbit is falling in such a way that you never hit the ground. There are some fairly standardised methods for working out the orbital velocity you’d need to orbit something at such-and-such a distance. While an eccentric (or oval-shaped) orbit would probably be possible in the grapefruit-egg scenario the maths for that is more complicated than I’m willing to get into right now, so we’ll stick with the basic circular variety. So now all we have to do is find out the typical masses of a grapefruit and an egg. 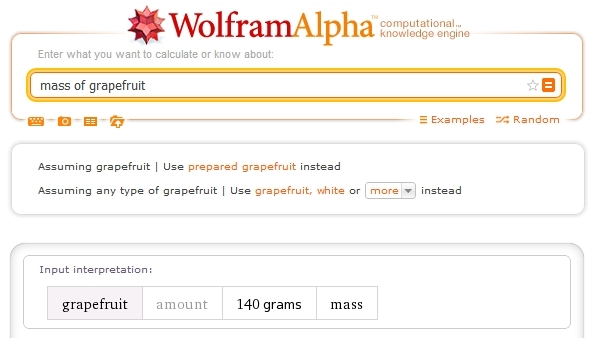 ENTER WOLFRAM ALPHA. God that thing freaks me out. Anyway, it says the mass of a grapefruit is 140g and the mass of an egg is 35g, so if we assume a fairly modest orbital distance of 100m, we get an orbital velocity of 8.6 × 10-7 ms-1, which is pretty bloody tiny (it’s literally slower than a snail crawls). Because the masses we’re dealing with here are so small it would only take a very small nudge to put the egg in orbit around the grapefruit (or around the barycentre of the grapefruit-egg system). I can’t make any promises for the long term stability of this orbit since I haven’t really factored in the motion of the grapefruit here at all, so it might deteriorate after a few dozen orbits and we end up with our delicious grapefruit cake again, but it is possible. Fairly sure the universe was around before 1999. Man, was 1999 really 13 years ago I’m old oh God.